There is a correlation between the physical and emotional body. When we can finally dissolve the emotional armor that is situated in specific parts of our body, then the commensurate physical illness will have a chance for a deeper healing. How do we acquire this blockage? This could be from early childhood traumas or from our own self-imposed fears, or even from past life imprints, if that is within your belief system. In some cases, just being yelled-at as a child can lay the groundwork for blocked energy later in life as we hold on to these “emotional darts” for years and years. There are many, many reasons we develop these blockages and it almost doesn’t matter! The main thing to consider is that we tend to attract our emotional blockages where we are weak and vulnerable. Over time, this “mass” of energy will often manifest as a physical illness in that part of the body! This includes every possible illness, including weight gain, cancer, arthritis, asthma, constipation, etc. Emotional therapy, such as talk-therapy is really very good for the bulk of your healing. But in most cases, there is a cellular imprint or a cellular memory or a cellular programming that is so deep that it needs something more profound or more esoteric for a full release to occur. That is the purpose of this ebook -- to offer valid emotional release techniques or emotional release systems that are known to helps scoop out the final vestiges of this old emotional pain. In this way you can feel hopeful for cleansing emotional blocks and releasing the cellular memory. Many Ways to Release the Cellular Memory. This ebook is simply a web page that you may view on your own computer or print out. You do not need to be connected to the internet to view this ebook. It is compatible with both PC and MAC computers. It is a one-page web page, which will become approximately 17 pages when printed out on the average printer. There is nothing else involved for you to do. There are no special viewers or readers required or any special software for you to install. The file is an .htm file and this is instantly viewable in your normal browser, such as Internet Explorer or Firefox. Purchase Your Instant ebook for $3.00 Now. 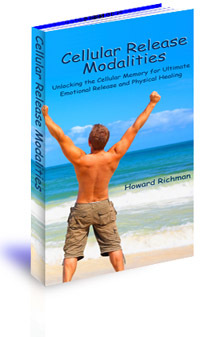 PLEASE NOTE: Cellular Release Modalities presents information that was first introduced in Howard Richman’s ebook, Weight-Loss and the Art of Focusing. If you already have this ebook, or if intend to purchase it, you do not need to buy Cellular Release Modalities. Also, please DO NOT PURCHASE this ebook if you want specific instructions on how to release the cellular memory via a specific technique. This wonderful ebook provides the most comprehensive RESOURCES ALL IN ONE PLACE for you to then CONTACT, to THEN learn exactly what to do! Let this wonderful ebook provide options for the healing that you have sought for so long. Available INSTANTLY as an ebook only from us! The cost is just $3.00 that you charge to your credit card or PayPal account. Pay NO SHIPPING and NO SALES TAX! The ebook is a downloadable html file which works equally-well on both PC and MAC computers. Please see our Anger management and anger control tips. Please see our free 10 Grief Tips, 10 practical self-help steps for someone going through the grieving process. See why you have to be careful when a company says that they have “natural” products! Please see our other ebooks.